AP(Eye) on the Hill is weekly! Here we highlight significant federal updates, particularly those that impact AAPI communities regarding reproductive, immigration, and economic justice. Learn about NAPAWF’s and other national AAPI groups’ federal policy work while you’re out on the ground! Fair pay and paid leave proposals introduced by Sen. Deb Fischer (R-Neb.) do not serve all working families. On Tuesday, February 10, Betsy DeVos was confirmed as Secretary of Education. 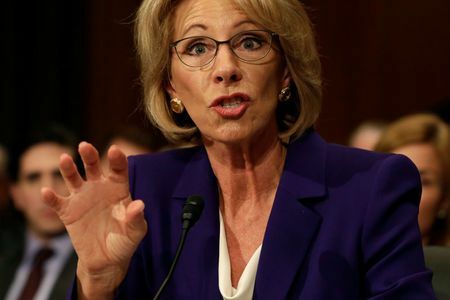 DeVos is a staunch advocate for educational vouchers, a system that would further redirect taxpayer funds to private schools rather than public schools, and is a proponent of increasing for-profit charter schools. Advocates across the country reacted to the nomination, including hundreds of students in New York City walking out of their classrooms. Alabama Senator Jeff Sessions was confirmed as Attorney General the following Wed, February 11 in a 47-52 Senate vote. Sessions has had a particularly rocky nomination process, receiving opposition from advocacy groups because of his record of voter suppression, racial discrimination, anti-LGBTQ rights, and opposition to the Violence Against Women Act. The U.S. Senate also confirmed Rep. Tom Price in a 52-47 vote for Secretary of Department of Human Health and Human Services late in the evening on Thursday, February 9. Rep. Price has opposed the Affordable Care Act (ACA) and has supported cutting Medicare and Medicaid. During the confirmation hearings, it was unclear whether Rep. Price supported a repeal of the ACA without a replacement plan. The three nominations this week have highlighted the partisan divide in the nominations with Republicans and Democrats voting consistently across party lines. The only Senator to cross party lines during these three votes was Senator Joe Manchin (R-WV) who voted “yes” on Sessions. More than 100 people gathered shortly after the confirmation hearing of Jeff Sessions as U.S. Attorney General to show resistance to the confirmation and the silencing of Senator Warren during the hearing. The gathering listened to a recitation of written testimony provided by Coretta Scott King in 1986 opposing Jeff Sessions’ nomination for a then federal judgeship position. Following the recitation of Coretta Scott King’s letter, the group marched to Sen. McConnell’s doorstep, and left protest signs and copies of the letter. Read the full letter in the Washington Post. During Wednesday’s hearing, Senator Warren read Coretta Scott King’s testimony to highlight Sessions’ history of voter suppression and racial discrimination until Senate Majority Leader McConnell invoked Rule 19 (an archaic rule meant to keep senators from “impugning” one another) to silence Sen. Warren. The quote "She was warned. She was given an explanation. Nevertheless, she persisted." became an uplifting way to highlight female activists all over the country. On Thursday, February 9, three judges on the 9th Circuit Court of Appeals unanimously ruled against reinstating the travel bans set forth by President Trump’s executive orders. In addition to increased vetting, detaining, and deportation of immigrants, the orders included a total ban on Syrian refugees and 120-day ban on refugees from seven Muslim-majority countries. Protests at one of these orders commonly referred to as a “Muslim Ban” erupted around the nation. The 9th Circuit Court of Appeals issued a 29-page order identifying the lack of a clear rationale for the ban based on national security concerns, as well as confirming the rights of states to challenge the order and the right for the public to travel, avoid family separation, and travel without discrimination. Read the court ruling at CNN.com. Working families had another reason to celebrate a few days later on Tuesday, February 7, when the Family and Medical Insurance Leave (FAMILY) Act was reintroduced to Congress by Senator Kirsten Gillibrand (D-NY) and Congresswoman Rosa DeLauro (D-CT- 3). The FAMILY Act would establish an Office of Paid Family and Medical Leave within the Social Security Administration and create an affordable, comprehensive national paid family and medical leave program. The FAMILY Act would also provide workers up to 12 weeks of paid time off in order to care for ill family members, care for a new child, or address their own health needs. Read the National Partnership for Women and Families’ press release here. On February 9, Sen. Deb Fischer (R-Neb) reintroduced the Workplace Advancement Act and the Strong Families Act. While the introduction is heralded as a push for pay equity for women and national paid leave, economic justice groups express skepticism. The National Partnership for Women and Families released a statement identifying flaws in the legislation. The Workplace Advancement Act, while it prohibits retaliation against an employee for inquiring or disclosing their wages, does not have a robust plan for supporting employers and employees and enforcing fair pay laws. Additionally, the Strong Families Act is a bill that would provide employers to take business-related tax credit to support employees on family and medical leave. Critiques of the Strong Families Act state that tax credit for leave has not been shown to expand access, but rather provide tax breaks for employers already offering paid leave. After multiple delays, Andrew Puzder, President Trump’s nominee for U.S. Labor Secretary, is scheduled for a confirmation hearing on February 16th. Puzder, the CEO of CKE Restaurants, has faced controversy immediately following his nomination due to inflammatory remarks about workers, conflict of interests with his business, and reports of labor rights violations. Recently, he has come under scrutiny for employing an undocumented housekeeper and evaded paying legally-required taxes on her wages until his nomination was imminent. This Friday, a federal judge will hear a preliminary injunction by the state of Virginia on behalf of lawful permanent residents detained at the Dulles International airport. With the influx of cases surrounding the executive order, it is likely that the U.S. Supreme Court will rule on the issue or the administration will have to adapt the executive order. In the meantime, the Muslim ban continues to be halted. Read last week's AP(eye) on the hill!